The Pages app on your iPad is the word-processing and page-layout tool in the iWork suite of apps. Pages gives you powerful tools for creating documents of all kinds. 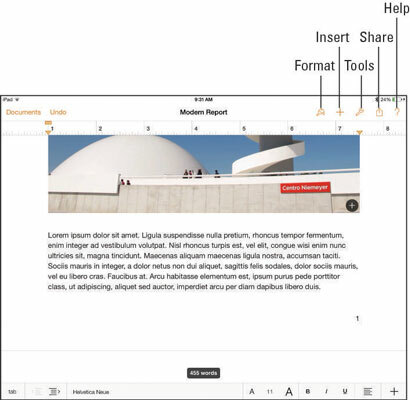 After you open a Pages document, you edit it in Document Editing view, shown in this figure. When you’re editing a document, Document Editing view remains open until you move to another document, return to the Documents screen, or leave Pages. When you leave an iWork for iOS 7 app and then return to it, remember that you return to the same location you left. When you’re in Document Editing view, the Documents button is visible at the left of the toolbar, at the top of the screen; tap this button to take you back to Documents view, where you can create a new document by tapping the button labeled with the plus sign (+). When working on a multipage document in the Document Editing view, you can quickly move through the document by swiping or flicking up or down. In Pages, you can touch and hold your finger anywhere at the right side of a page to bring up the navigator (shown in the figure), which shows a thumbnail of a page; you can move very quickly through the document by dragging up or down on the screen. When you’re on the page you want, just lift your finger off the screen. If you don’t want to leave the page you started from, swipe to the right to make the navigator disappear.